Tag Archive | "Legg Mason Tennis Classic"
The customary Washington heat returned today melting down two of the top remaining seeds. In the first match of the afternoon, Tomas Berdych, the 2010 Wimbledon finalist and number one seed, was booted by Xavier Malisse 6-4,3-6, 6-2. 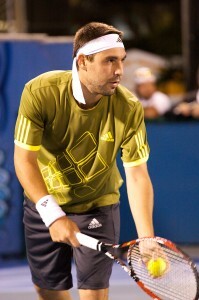 The same fortune befell Fernando Verdasco, the third seed. The Spaniard was ushered out by Marcos Baghdatis 7-6,6-4. 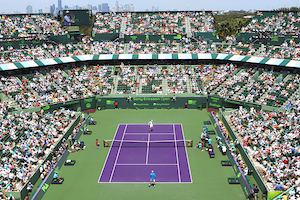 In the evening session, David Nalbandian bested Gilles Simon, the 13th seed, 3-6,6-2, 6-3. 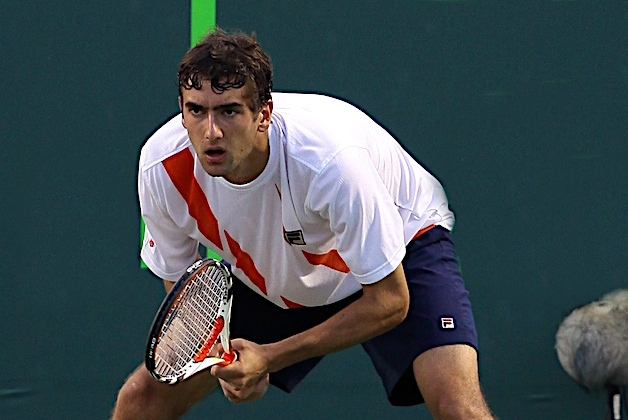 At number four, Marin Cilic is the highest surviving seed. Cilic toppled Janko Tipsarevic 7-6,6-4. Having split their prior two encounters in 2006, for both Malisse and Berdych it was case of getting reacquainted. Malisse drew first blood by capitalizing on his second break point chance in the third game. The Belgian went on to readily consolidate for 3-1. Down love-30 in the fifth game, Berdych worked his way back to game point. However, with Berdych failing to convert on eight game points, Malisse seized a second break and 5-2 lead. 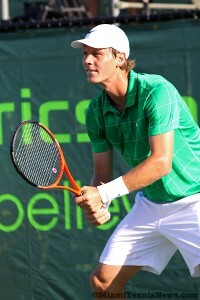 Although Berdych narrowed the arrears to a single break, with the insurance edge Malisse managed to wrap up the set. Unable to break in the second game, Berdych was gifted a double fault on double break point by Malisse for 5-4. The Czech secured the following game to force a third set. After opening the fourth game with a double fault, Berdych compounded it with a series of unforced miscues. As a result, Malisse inched ahead 4-3. With Berdych misfiring on three consecutive backhands, Malisse increased his lead to 5-3. For good measure, Malisse broke Berdych one last time to earn his first semifinal berth in Washington. After the match, Berdych expressed his discontentment with playing his third round on a non-show court and being scheduled first today after getting to his hotel late this morning. At the preceding conference, Berdych alluded to jet lag being an issue, the early match he felt added to his wretched play in the first set. Nevertheless, Berdych acknowledged that Malisse merited the win because he performed well. 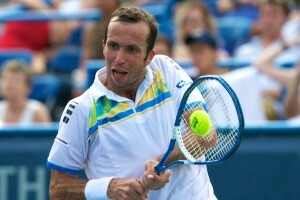 For his part, Malisse commented that the key to his victory was his ability to return. Malisse remarked that the third set was near perfect tennis from his end. 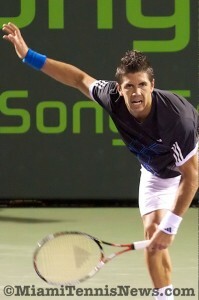 In the second singles, Verdasco had three break opportunities in the opening game. 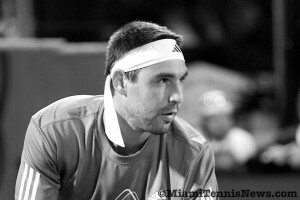 Baghdatis survived the challenge and went on to break for 2-1. Yet, Verdasco quickly got back on serve by manufacturing a break of his own. Ultimately, the set was decided by a tiebreaker. Courtesy of three double faults by Verdasco, Baghdatis built a 5-2 advantage. As another Verdasco forehand traveled out of play, Baghdatis bagged the first set. After Verdasco held to carry the initial game of the second set, Baghdatis netted a backhand giving the Spaniard triple break point. However, Baghdatis once again disappointed his rival. The next game, a disenchanted Verdasco dropped his serve. Although Verdasco immediately equalized the set at 2 all, the errors became uncontrollable leading to further breaks. When Verdasco’s forehand pass sailed long, Baghdatis had double break point. With Verdasco flubbing a backhand down the line, Baghdatis secured a 5-3 lead which was the difference in the match. Q. This was your first meeting with Baghdatis, was his game different than expected? Verdasco: No . . . I did not play [well]. It was very windy . . .so it was tough to play for both of us . . . [Too] many double faults [because of ] the changing direction of the wind . . . The bounce of the court was sometimes [irregular] . . . The conditions were not easy. 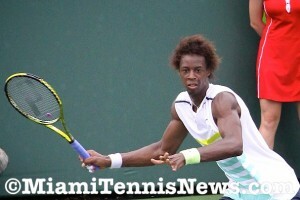 MiamiTennisNews was curious about Verdasco’s racket conundrum. Q. Earlier in the year you experimented with a different brand and you’ve since switched back. What’s the reason? Verdasco: Before [the season started] I tried Yonex and I was suppose to play in Australia with it. But, [the manufacturer] did not [fabricate] the racket the way I wanted. So, I was told to play with my old racket in Australia . . . In San Jose and Memphis, I played with the Yonex racket. On clay in Acapulco, I [noticed] it was not the racket I want . . . After Acapulco, the [team] spoke to Dunlop to see if it can make the [equipment that suits] my game. Dunlop worked on it for a few months, that’s why I played the clay and grass seasons with a black racket. It’s still an [evolving process], trying to find the perfect racket. It’s never easy like changing clothes or sunglasses because it’s such an [integral] part of the game. Q. Any plans to defend your title at the Pilot Pen? Verdasco: I will just be playing the two Masters and the [major]. Last year I won New Haven, it was great and I enjoyed it . . . The people really treated me well . . . But, last year, when I got to the U.S. Open, I had a micro-tear in my abs and lost in the first round because of too many matches in a row. I don’t want that to happen this year because I want to do well in [New York].